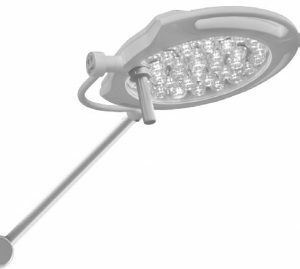 Recent Posts What are the Most Popular Surgical Light Brands for Operating Rooms in Canada? 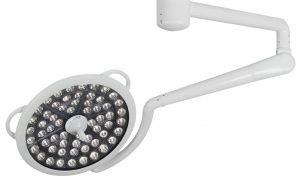 Have you ever wondered what the most popular surgical light brands are for Operating Rooms in Canada? 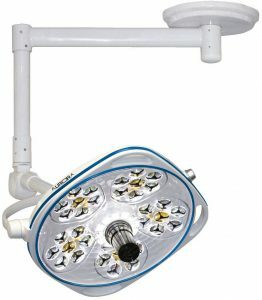 Judging by the amount of inquiries we get for operating room lights, you wouldn’t be alone. In this article, we’ll discuss the brands that are most commonly mentioned, and which are perceived to have the most market share in Canadian hospital operating rooms. We’ll bring you a non-biased look at all the brands and manufacturers that are deemed the most popular (based on decades of experience, market share, market research and general popularity). 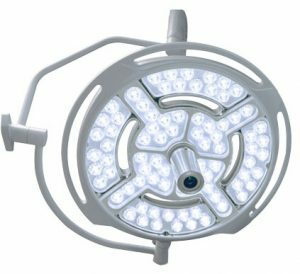 *Please note that we are only including lights in the surgical light or operating room light categories on each of the manufacturers’ websites. 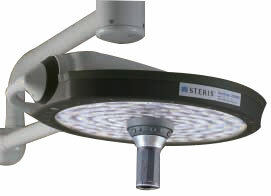 Skytron’s first product was actually a surgical light, which was the first focusable light for operating rooms. The Aurora Four is the latest and greatest of the Aurora line. These lights feature a “one-twist” of the handle to move the focal point up or down. 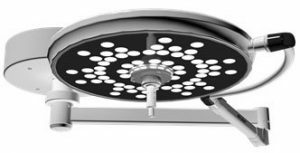 Other features include shadow-reducing vertically segmented reflectors, selectable color temperature, and 360° rotation on all axes. 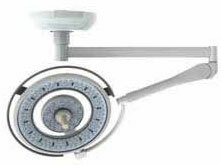 A floor stand model is also available for single light fixture. 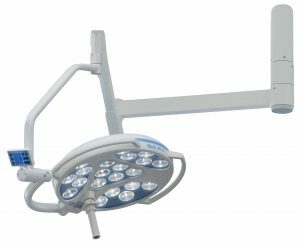 The Stellar XL LED line features advanced shadow control via its Vertically Segmented Reflector Design (VSRD), which optimizes contouring and depth perception required for accurate visualization of the surgical field. 2,135 rays of light overlap to capture 99% of the light. These are also available as an upgrade option from the prior Stellar halogen version lights.. 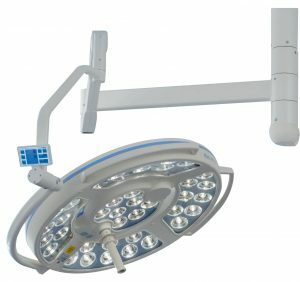 The latest in the Skytron line of operating room lights, the Aurora Astro is considered to be an alternative to major surgical lights, while still providing excellent light. 1,281 rays of light overlap to create a crisp, homogeneous spot with ideal shadow control (captures 99% of the light). Available in single, dual, and boom configurations. The modular design means that you can easily upgrade as you need in the future. The M-5 model consumes 1/3 the heat of their previous LED technology. Specific again to the M-5 model, 84 overlapping beams help minimize shadows. One of the differentiating features of the G-Series is that it uses a phosphor coated, single-colour LED chip as opposed to multi-colour LEDs. When compared to similar halogen lights, the Harmony LED reduce energy consumption by 75%, do not require bulb changes and produce 34% less heat. 84 overlapping beams of light help to minimize shadows. 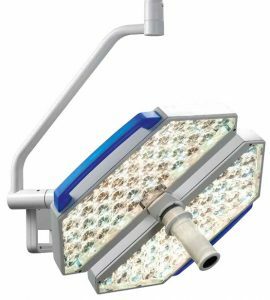 Undoubtedly known more for surgical tables than surgical lights, Maquet offers three options, very different from each other. 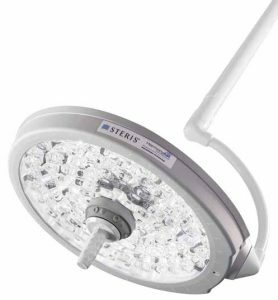 Designed for minor surgery, the Flux Stability Program is included in all lightheads. The Flux Stability Program works by increasing the current to the light if the light loses illumination over time. A differentiating feature of the PowerLED is the “boost” function. If any complications arise or the conditions call for it, the boost uses spare capacity for you to boost the light intensity. 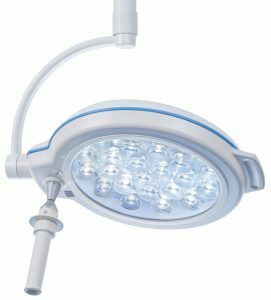 This model also uses white LEDs, as opposed to colour, and has an irradiance of less than 500 W/m2, which helps eliminate heat. The PowerLED light lasts “40 times longer than halogen bulbs” and “reduces energy consumption by 30%”. There are two models under this line: the VOLISTA Access and the VOLISTA StandOP®. One of the great things about the VOLISTA is that it will provide a minimum of 50% illumination in the event that there are power fluctuations. This light also has the “boost” function. Stryker acquired Berchtold in April of 2014, and with that came the Berchtold product portfolio, which included surgical tables, equipment booms, and surgical lights. The LED F Generation lights feature Precision Beam Technology™, which focuses 650 overlapping beams of light into one homogenous column, which help create ideal field depth and minimize shadows (traditional LEDs typically provide only 80 to 100 individual beams). Its design takes into account the ease to upgrade in the future. 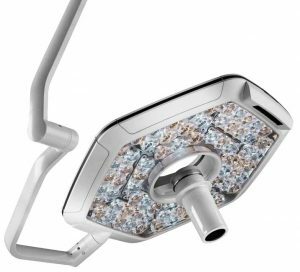 A few features that stand out with this light are the large 41” column of light and Stryker’s proprietary reflector technology. Made of aluminum and glass, these lights use 38% less energy than traditional halogen lighting. 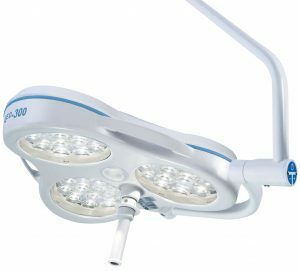 Similar to the AIM 200 from Burton as a predicate device, the Visum Blade LED contains 66 LEDs and has a rated lifespan of 35,000 hours. Most common configurations were not available at the time of publishing this article. In August 2014 Hill-Rom® acquired Trumpf Medical. Trumpf Medical prides itself being the first to supply LED lighting to an operating room back in 2005. Now, Trumpf is under the Hill-Rom® umbrella of products. A noticeably standout feature with this light is the hole in the middle. 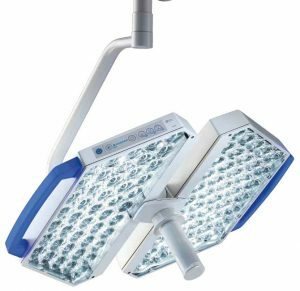 While the majority of other surgical lights have solid backings, this one has an opening to encourage improved airflow. 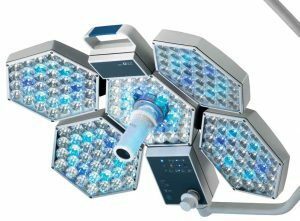 Another formidable feature is the 3D sensor technology that continuously analyzes the surgical area to automatically adapt the lighting conditions and eliminate the need for manual adjustment. The manual shadow management function allows for backlighting of obstacles, which results in up to 25% more light in the depths. 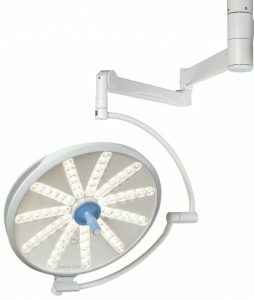 If the light is moved, the light measures the distance from the surgical site and automatically adjusts the light to keep the same focus. The integrated Adaptive Light Control Plus (ALC Plus) automatically adjusts the illumination of the light if it is moved. 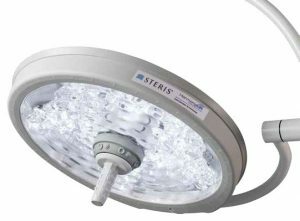 With the LEDs being completely cased in with specific convergence lenses, 160,000 Lux of is produced with only 65 Watts. This light can manually adapt itself to three main working distances: near, normal, and far. While still providing LED quality light, the TruLight™ 3000 is the most economical of the TruLight line. Founded in 1974, Amico has manufacturing facilities in the US and Canada. 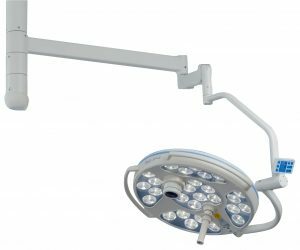 The Mira line of surgical lights have the same configurations: ceiling, wall mounted and mobile. Those, in turn, can be either single or dual, and they can be extended or standard. 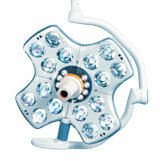 The Mira50 LED is primarily used for minor surgery and diagnostics. The slim design makes it ideal for smaller spaces. 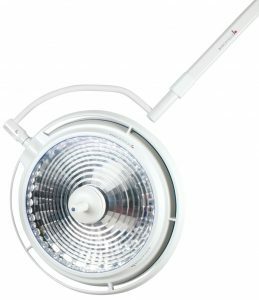 The Mira65 LED is a virtual copy of the Mira50 LED, and the only difference is that the Mira65 can reach 65,000 Lux, whereas the Mira50 LED can reach up to 50,000 Lux. Mira90 LED can reach up to 90,000 Lux. These lights include white LEDs as opposed to coloured, which gives off a more natural light. The lights provide a minimum of 50,000 hours and were designed to be easily upgraded in the future. Founded in 1948, this Germany-based company focuses purely on lighting products. The business name refers to Dr. Ludwig Mach, an uncle of Walter Mach an engineer who is one of the founding partners. They take pride in manufacturing 85% of their product in-house. 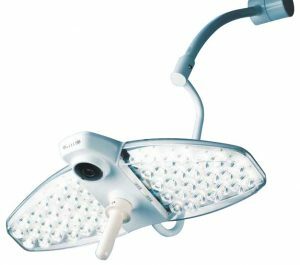 MC and Smart models feature Multi-Colour-chips that allow the surgeon to change the color temperature. The SC model has Single-Colour-chips, which do not allow you to change the colour temperature. Each model consists of a different number of LED bulbs, which consequently changes the CRI and power consumption. This model is only available for ceiling mount. Considered second tier next to the LED 5 product line, the LED 3 product line has less number of LED bulbs. This model is available for ceiling, wall and mobile. Next, going down the line, is the LED 2 model. This model is available for ceiling, wall and mobile. The LED 300 line is where the lights start to differentiate in terms of shape and design. Apart from that, the main difference is the duo focus feature, which is when the single light fields join to overlap one field with increased light intensity. This model is available for ceiling, wall and mobile. A purely mobile light, the LED 115sb is fixed focus. Considered to be the perhaps the smallest light of the entire lighting product lines, the LED 150 F and FP have focusable beams where the 150 is a fixed focus light. Founded in Germany in 1889, Dräger is in its fifth generation as a family run business. This light has an optional wireless video transfer HS camera, as well as colour temperature adjustments. The main difference between the Polaris 100 and 200 is that the latter comes with an extra 18 LEDs. Both are interchangeable without having to modify external dimensions. 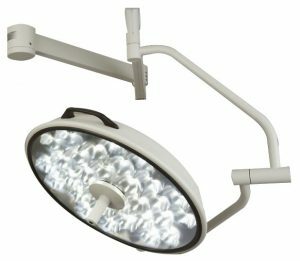 A division of Medical Illumination, Nuvo formed in 1997 with the special purpose of creating ceiling-mounted equipment for operating rooms. Two years later, they went to market with their first surgical light. Since then, they have installed over 2,000 lights in over 1,000 operating rooms in the US. Billed as being “brighter, whiter, cooler and more capable” than any previous technology, one interesting feature with this light is the Cross Focus Technology (commonly known as light overlap) and how it enables the LEDs to move independently of each other while adjusting the pattern size. This flagship light for Nuvo is billed as being “the most pure, uniform white light possible”. Additionally, Nuvo’s compact and lightweight design helps it fit into smaller spaces. 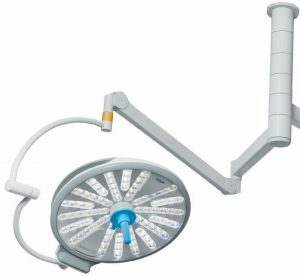 While there are many more surgical light manufacturers out there, these are some of the more popular ones. Knowing your options can help you make a more informed decision. 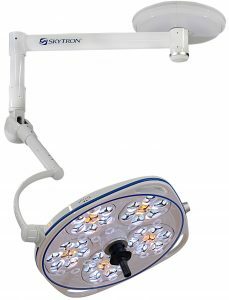 Meditek is a provider of Skytron surgical lights for Western Canada. 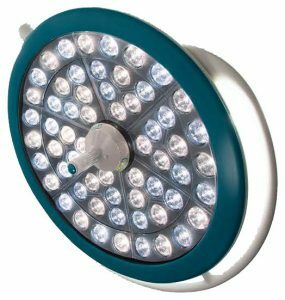 Our capabilities also include other surgical light manufacturers, such as Burton, as well as the ability to remanufacture surgical lights to as-new condition.